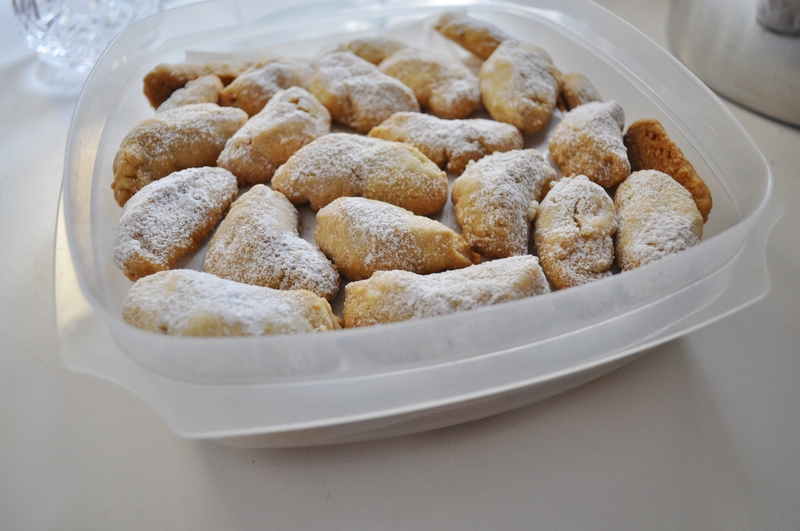 Vanilla Crescents. Grandmom’s cookies. Made with almonds. My mom made these for many years. Now, she doesn’t do them anymore, and I was determined to find the recipe and carry on this tradition. In my Time Life series of cookbooks. The Cooking of Vienna’s Empire. These are the cookies I remember from my childhood. But, to make them the best, I had to find really good ingredients. Like these. All of the ingredients with the exception of the confectioners’ sugar came from Roots. Trickling Springs butter. 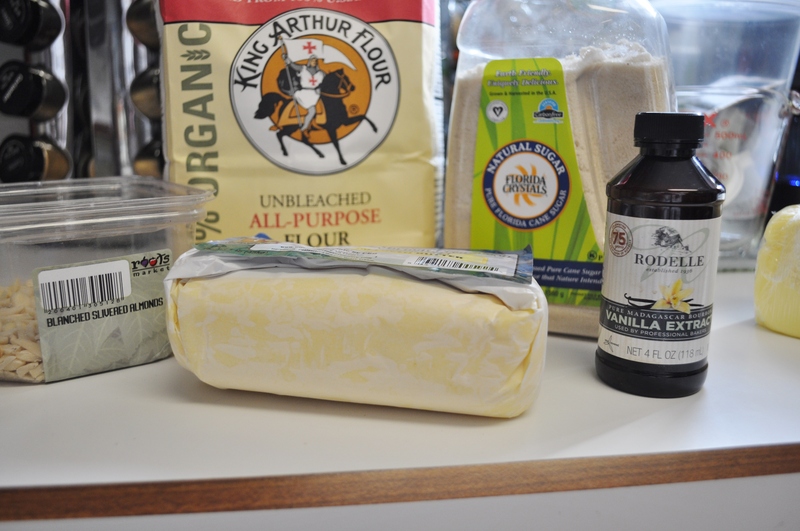 King Arthur Flour. Natural sugar. Vanilla extract. Blanched almonds. Oh, and flaked sea salt, not pictured. 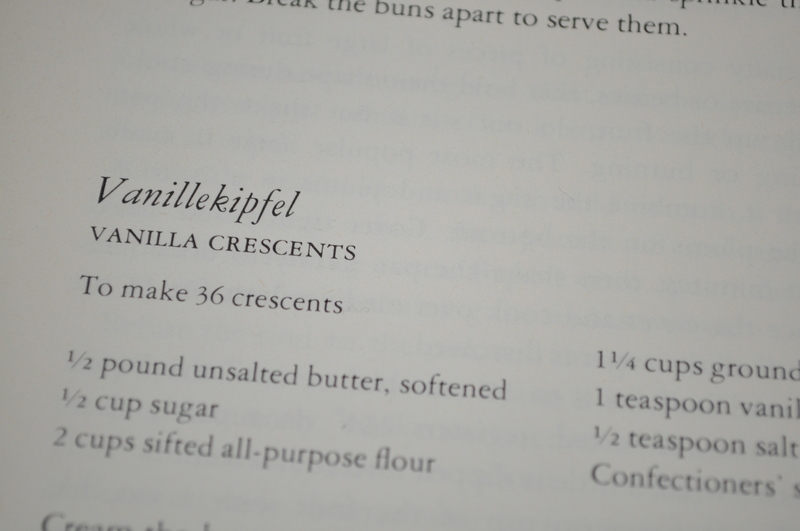 Cream the butter and sugar together in the stand mixer, until light and fluffy. 2 cups sifted all purpose flour, beaten into the butter/sugar mixture a 1/2 cup at a time. Add these three items to the mixer and continue to beat until slightly stiff. I created a large disk of the dough and refrigerated it overnight. Preheat the oven to 350 degrees. Break off pieces and shape into crescents on a floured work surface. Place on buttered cookie sheets, about a 1/2 inch apart. Bake for 15-20 minutes, until they are just becoming lightly browned. Remove from oven, cool on pans, then transfer to a rack. Dust with confectioners’ sugar. Posted in Food and tagged cooking, Food, holidays. Bookmark the permalink. I bought my mother that same cookbook years ago! I imagine a great deal of the flavor has to do with the high quality butter. The stuff you buy at the regular grocery stores, even if organic, just doesn’t have that flavor. In simple cookies like these, the quality of the butter (& vanilla) make a huge difference.